No surprises here, since Roberts announced each of them would be in. Culberson out-hit Enrique Hernandez in September, and offers enough versatility for this roster. He can play shortstop, second base, third base and left field if needed. Barnes is a two-fold surprise. One, it means the Dodgers will carry 11 pitchers (including seven relievers, not eight like I guessed). Two, the 26-year-old from Riverside has 41 games of major-league experience and a career .180 batting average. He’s never played in the playoffs. So what gives? Barnes can play second base and third base as well as catch. He even started a Triple-A game in center field this year. Andrew Friedman pointed out that having Barnes potentially frees up Ruiz, the second-string catcher, for pinch-hitting appearances against the Nationals’ left-handed relievers. The Dodgers’ .213 batting average, .290 on-base percentage and .332 slugging percentage against lefties all ranked last in the majors (by quite a bit), so that has some value. Barnes can also pinch run; he stole 18 bases in 21 attempts at Triple-A. The Dodgers don’t have much team speed outside Barnes, Puig and Toles. Urias is the Game 4 starter as of now, if there is a Game 4. The 20-year-old pitched his way into a postseason roster spot already; the only question was whether he’d start or relieve. He’s probably a better option than Brett Anderson, Scott Kazmir or Brandon McCarthy, at least in terms of upside. A 3.39 ERA in 77 regular-season innings helps ease any fears of making Urias the youngest pitcher to appear in a postseason game since 1970. Kershaw might take the ball on short rest in a potential Game 4, which he’s done before, so Urias’ role might be moot. By bringing seven relievers, it adds weight to Roberts’ promise that Hill, who starts Game 2, will be extended past his previous blister-induced limitations. Maybe Kershaw and Maeda get a longer leash, too. I had Fields on my “just missed the cut” list in my previous two guesses, mainly because I suspected Roberts would carry another left-hander against a team with Daniel Murphy and Bryce Harper in its lineup. But Fields has actually held lefties to a lower OPS (.788) this season than righties (.869), and hasn’t given up a home run to a lefty all year. He allowed a total of five hits (in 40 plate appearances) since the beginning of September. J.P. Howell, the first left-hander on the chopping block, has faced 77 batters since Aug. 1 and allowed 27 hits — a .350 batting average. Infielder/outifleder Rob Segedin, and pitchers Howell, Alex Wood and Brock Stewart are traveling to D.C. on the “taxi squad.” In case a player is injured in Game 1, they can be activated for Game 2. 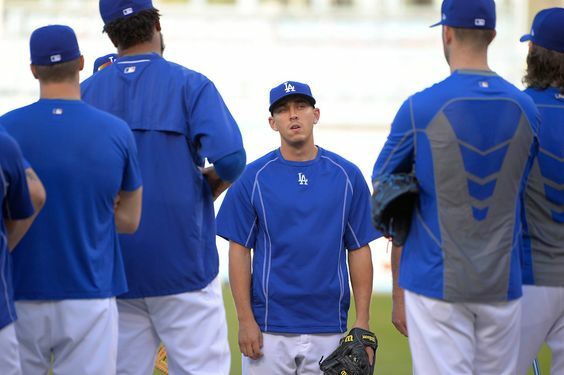 The rest of the news from the Dodgers’ only pre-series workout in Los Angeles is here. The photo gallery is here. Video highlights are here. This entry was posted in JP on the Dodgers and tagged Adrian Gonzalez, Andre Ethier, Andrew Toles, Austin Barnes, Carlos Ruiz, Charlie Culberson, Chase Utley, Clayton Kershaw, Corey Seager, Grant Dayton, Howie Kendrick, Joc Pederson, Joe Blanton, Josh Fields, Josh Reddick, Julio Urias, Justin Turner, Kenley Jansen, Kenta Maeda, Luis Avilan, Pedro Baez, Rich Hill, Ross Stripling, Yasiel Puig, Yasmani Grandal by J.P. Hoornstra. Bookmark the permalink.